You know how there’s that cliché: “waiting for the other shoe to drop”? I feel like that cliché can be used to sum up last week’s episode of Suits titled “We’re Done” and this week’s “Exposure.” I didn’t have the opportunity to post a review of last week’s episode due to my escapades at LeakyCon, so let me sum it up for you: Rachel told Mike that she kissed Logan. Mike got fired and then punched Logan because of his kiss with Rachel. Mike moved out at the episode’s end because he couldn’t trust Rachel anymore (but not before he stayed at Harvey’s and Rachel stayed at Donna’s because those two are seriously like their parents). Louis made an illegal deal with Forseman that Jessica and Harvey did not know about. Jessica rewarded Louis for his work on the case and saving the firm by allowing him one wish (because apparently Jessica is a genie now). Louis decided, after listening to Rachel’s sob story about how she messed up her chances with Mike because of something she did, while Louis CHOSE to not fight for Shelia, that he would use his one wish to get more vacation time to see his former fiancé. However, with Mike at rock bottom and about to take a job with Forseman, Louis seizes the opportunity to save Mike, which was a brilliantly selfless move on Louis’ part. Louis uses his one wish to hire Mike back at the firm so that he will not have to sell his soul to the devil (Forseman) like he did. And that’s what you missed on Suits! “Exposure” focuses on this really amusing tennis match – the firm fights Cahill, then doesn’t, then fights him, then doesn’t, then fights him… then doesn’t regarding obtaining the Gillis Industries takeover documents. The episode is peppered with the amazing banter that made me fall in love with it in the first place, and it also contains some serious and whiplash-inducing see-sawing in the plot. There is no REAL plot of “Exposure,” to be honest: what you see in the episode are the aftershocks of “We’re Done.” There is no new information presented, really. Mike gets a change of scenery by inhabiting Harvey’s old office, but that’s really all that changes between the previous episode and this one. It feels like this episode tries to play with viewers in terms of dramatics regarding Louis’ ill-advised and illegal decision with Forseman. Instead of being at the edge of my seat, wondering whether or not Pearson Specter’s documents would be turned over to Cahill and the SEC, I found myself caring less and less as we bounced between “we’re fighting him because if we don’t, he’ll just make something up to pin on us” and “we’ll give him ALL our documents” every twenty minutes or so. That’s not to say that “Exposure” is a bad episode, really, but it doesn’t grab your attention and leaves you feeling rather lukewarm at the episode’s end because of COURSE the firm would finally make the absolute decision to turn over all of the documents; there’s no way the show would allow us to forget that Louis committed a felony and there is no way that they would allow him to get away with it without consequence. So while the episode was amusing in some aspects (Harvey/Jessica and Donna/Mike bantering has returned) and necessary in others (Mike/Rachel confrontation, bringing Mike back to the firm), I feel like this episode could have easily been five minutes and a coda on “We’re Done,” rather than an hour long. Nevertheless, let’s discuss some of the relationships within this week’s episode of Suits because there were some rather important ones. Can I just say how glad I am that Harvey and Jessica are no longer at each other’s throats? I feel like I fluctuate on my feelings toward Jessica, to be honest. I respect and admire her a lot of the time, but there are some moments and episodes where she is just plain unlikable (and that’s true of all of the characters on the series, not just her). Still, nothing pleases me more than when Harvey and Jessica get to banter like the Pearson Specter parents that they are and this episode both re-established that dynamic and also reminded us why they work so well together, professionally, in the first place. They are Bonnie and Clyde, after all, right? I admit that I’ve missed the bromance between these two most of all. It was great and enlightening and totally worth the character development that we saw in Mike for the takeover portion of this season (more on this in a minute, but I think that gave him the confidence he needed to return to Pearson Specter at the top of his game and also the humility to do things like listen to Katrina), but I missed Harvey and Mike’s bond. I missed the fact that Mike is probably the only person apart from Donna that Harvey REALLY cares about. I missed their sass and their interactions and I’m glad that “Exposure” brought Mike back and that both Donna and Harvey brought him back in style. How nice of Harvey was it to give Mike his old office? I know that there have been running themes throughout the season of Harvey seeing Mike as his protégé, but I think it’s more than that: I think Harvey genuinely has grown to respect Mike as a person rather than just see him as an extension or lesser version of himself. And I think that Harvey has grown because of his relationship with Mike; I think he’s learned to be more sacrificial and less self-absorbed. I think he’s learned that people have value and you cannot just dismiss them. And I think he’s learned how to be more caring and considerate, even when he doesn’t agree with everything that Mike does (for instance, allowing him in “We’re Done” to stay at his place while he figures stuff out with Rachel). Honestly, I’m glad that the “prodigal son” has returned, because it means that we’ll get to see how Mike’s time away impacts his relationships with other people indirectly and directly. There isn’t much to say about the Mike/Louis “story” this week except for this: I am really impressed at how perceptive Mike is and was (and how quickly Harvey and he pieced everything together but I think that the writers were frantically trying to summarize in that scene) with regards to Louis and his behavior. The old Mike Ross probably would have shrugged off Louis without a second thought. He would have dismissed him as being off or weird but likely wouldn’t have cared much beyond that. However, with the knowledge that Katrina presented him, I think Mike is consciously trying to be more intentional about his office relationships with people. He’s learned through his time at the firm and time away that being careless with how you handle professional relationships can only be problematic. So when Louis begins to act weird around Mike, he doesn’t brush him off or dismiss him. Instead, he begins to really contemplate WHY Louis is acting the way that he is. He owes Louis a lot, really: he owes him not just for the job but for rescuing him from making a damning decision that very well could have ruined his life. So Mike’s response is not to judge and not to tattle but to sit down with Harvey out of genuine concern and express his worry. This is a shift from the Mike we’ve seen earlier this season (cunning and vindictive) and the Mike we’ve seen interact with Louis before (childish and petty). I love that Mike and Harvey are concerned and I love that there’s a different layer to Mike’s relationship with Louis now that can be explored featuring less blame and more concern and pity. And now, we turn our attention to my least favorite portion of the evening: the Mike/Rachel drama. I applaud Mike for making the decision to stay away from Rachel in order to clear his head. He needs to get the image of her kissing Logan as far away as possible and he’s preserving any future relationship with Rachel by doing so. I admire Mike, really, for making this decision even though it was difficult. He loved Rachel; he wanted to spend his entire life with her and when every other wall crumbled, he thought that the ONE that would stand would be her. But now, their relationship is further complicated by Mike’s decision to return to Pearson Specter, making them co-workers. Donna gives Rachel advice – she tells him to give Mike space – which Rachel does not heed. At all. And this is the part of “Exposure” that I could not stand. Rachel lied about Harvey assigning her to a case that Mike was working so that she could be near him (a lie that Donna harshly – and rightly – condemns her for later on). The problem is that Rachel will not listen in this show to ANYONE with a semblance of reason. She cheated on Mike and returned to him with a cutesy little line in hopes that somehow everything would magically repair itself. She had given him time and space, after all… days’ worth of it. What grated me most about Rachel this episode was that her actions effectively tried to lessen the weight of her indiscretion with Logan. In approaching Mike shortly after he moved out, she was expecting him to forgive her or pretend that he forgave her; she was lessening the severity of her actions and expecting Mike to do the same. But Rachel made a mistake and her second was to presume that Mike could easily forgive her for it. Rachel then continues to disobey everyone and their opinions and shows up at Mike’s hotel, explaining that she learned to trust him again when she saw him with Tess and that if she could do that, he should figure out whether or not it is possible to love her – Rachel – again. My biggest facepalm moment occurred when Mike ends the episode by showing up at Rachel’s office door in an apparent attempt to begin the process of working things out. Let me just take a moment here to lament the fact that RACHEL HEEDED NO ONE’S GOOD ADVICE, LIED, AND WAS STILL REWARDED BY HAVING MIKE RETURN TO HER AT THE END OF THE EPISODE. Suffice it to say, Rachel Zane was my least favorite character on television this week. Oh, Donna, my sweet queen. The woman threw Rachel some great advice, which she promptly ignored, in regards to relationships with the people you work with. And then – beautifully – Donna explained that she had lied before: she had slept with Harvey years ago. Rachel was rightfully stunned at the admission, but Donna explained that everything worked out the way it was supposed to and they were able to return to being friends and colleagues after all that had happened between them. She admits that, had things gone differently and had Harvey been more emotionally mature, she would have wanted to make things work between them. And then there’s this moment where Rachel seems to recall what Donna said a year ago about never being able to go back to the way things were once you’ve crossed that line. We see Donna’s face flicker for a moment before she nonchalantly says: “I lied.” Donna doesn’t lie, though, and I think this little moment was just recognition that she and Harvey cannot be completely fine, even though she keeps telling herself and other people that they are. There’s a moment between Harvey and Donna at the end of the episode where they’re being their typical flirtatious and bantering selves, and Harvey explains that they can order in food and work on a case together. You almost hear the pause in the room in which Donna recognizes the words that she told Rachel earlier and she interjects by explaining that she has a date and cannot be at Harvey’s beck and call. He honestly seems a little bit stunned by this at revelation but accepts it and even banters with Donna a bit more before she readies herself to leave. I love how complex the Harvey/Donna of it all is, but another part of me also wants to seek some sort of confrontation or resolution. It’s clear that Donna is dating and it’s clear that Harvey has done his fair share of that in the recent past, but it’s also pretty abundantly clear that these two have feelings for each other. Instead of dancing around their relationship every season, perhaps one day we will get a resolution. 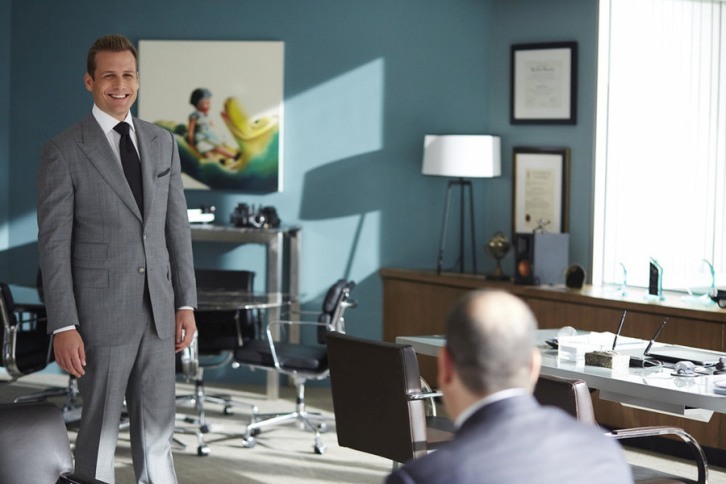 Until then, “Exposure” serves as a good example of Suits’ complex character relationships and dynamics, both how they affect romance and how they affect personal and professional relationships on the series. I hope you're buckle up, readers, because it’s sure to be a dramatic ride. MVP for this episode goes to Sarah Rafferty for consistently portraying Donna Paulsen as a strong, beautiful, complex, and flawed character. Thank you, Sarah! “Louis, please stop saying ‘bowels.’” Katrina was seriously on FIRE this episode. I love her a whole lot now. Hey, finally references to Mike’s photographic memory! Katrina’s awkward hug to Mike was the BEST part of this episode, hands down. I love this show and have watched it from the first episode but I have to say that the swearing/cussing is really excessive this session. How many times can you say GD in one conversation and not have it sound totally out of place. Just use nicer words guys. I feel like this season has been missing a bit of humor (Harold should come back!) but now I think it has turned the corner. Still, I have loved the show all the way along regardless, it is a credit to the writers and entire cast.